Most people don’t think of special fx when you say Christmas movies, but you would be surprised. Most of the modern-day Christmas movies have some crazy high-jinks, elf ears and other things, that require a special fx makeup artist hand. So, from now until Christmas (12 days), I decided to talk about the Christmas movies that I love, that also have special fx makeup in them. I will also include the IMDB listing of the makeup & special fx makeup crew that made everything possible. On this first day of Christmas, the movie I have on my list is… Home Alone (1990) directed by Chris Columbus. The classic Christmas film where a an 8-year-old boy (Macaulay Culkin), who is accidentally left behind while his family flies to France for Christmas, has to defend his home against idiotic burglars (Joe Pesci & Daniel Stern). I remember when this film was first released, it was the biggest thing since sliced bread. Over a decade later, this movie still makes people laugh out loud when the burglars take a beating. 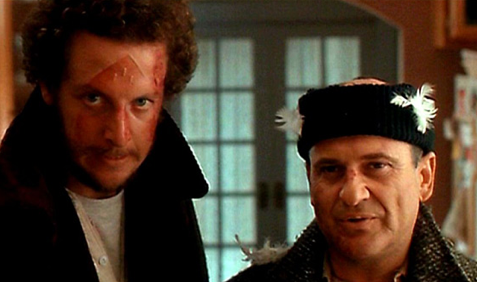 Of course they didn’t really drop an iron on Daniel Stern’s face to make that mark, or burn Pesci’s head. Speaking of that mark. I believe this was the time before Tinsley Transfers, so I wonder what they used? Here is a list of makeup/special fx artist whose work made Home Alone so great. It’s interesting how we think of Special FX for horror movies, but not funny Christmas films. Looking forward to reading what you have on the rest of the list!